A Green Mushroom: Are You Thinking With Portals? Are You Thinking With Portals? I am! I can't wait for the release of Portal 2 next Tuesday. Portal is one of the best games I've played and I can't even imagine the mind bending that will happen in the sequel. I like the idea of thinking with portals, but here's the sad news. If I had a portal gun in real life I would probably just use it to get rid of my commute to work. Lame, I know, but if I tried to do much more with it I would definitely have a portal related accident. Anyway, if you loved portal there's no reason to skip Portal 2. A whole new single player campaign. New twists in the gameplay. And best of all, Co-op! Seriously, who doesn't want to be part of a portal slinging robot duo? My brother and I are going to dominate that mode. I also stumbled across this awesome Portal comic from valve. 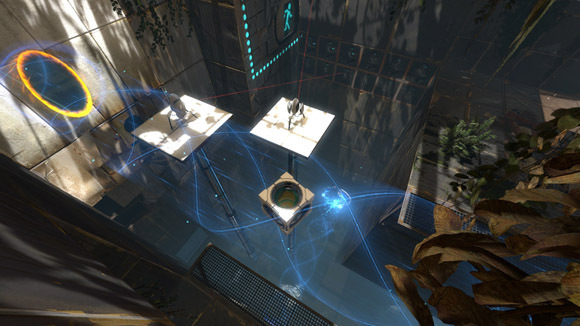 It's worth checking out for the art style alone, but the story helps bridge the gap between Portal and Portal 2 too. If you don't already have Portals on the mind I'm sure you will next week when the game launches and the gaming community goes into a frenzy. Fair warning.